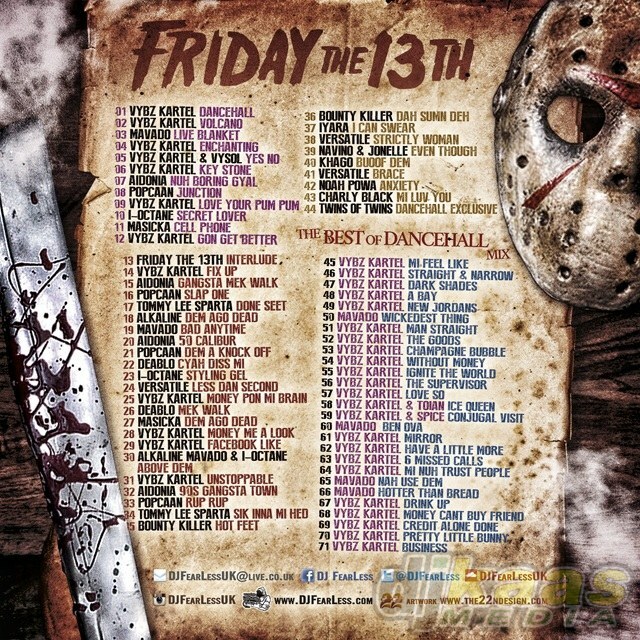 Here is DJ Fearless’s latest dancehall mixtape called “Friday The 13th”! It features brand new music from Vybz Kartel, Mavado, Aidonia, Popcaan, Alkaline and more, this mixtape is front to back Dancehall hits only! DJ Fearless delivering pure badness as expected and opening the mixtape with some tracks for the ladies. Get ready for all the latest riddims and hottest tracks from current big hitters and legendary artists, PLUS a bonus mix called Best Of DanceHall which kicks in around halfway through the mix.